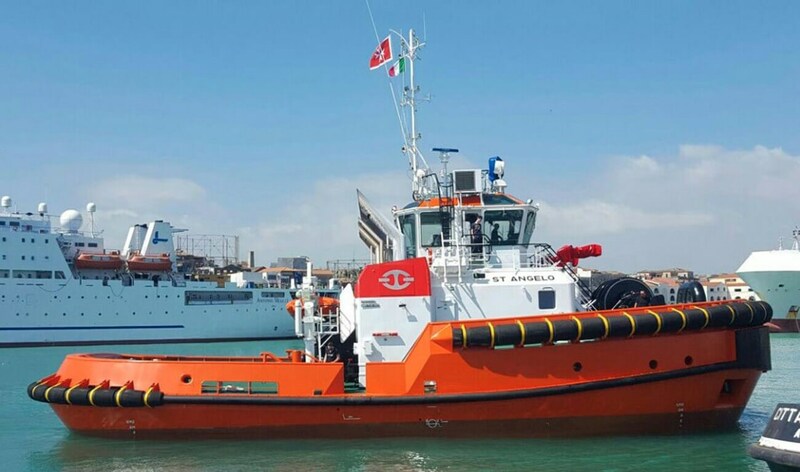 Home › Sea Tug › ASD Tug › ASD Tug 2813 › ASD Tug 2913 "St. Angelo"
On Friday, 9th February 2018 Tug Malta’s Damen ASD Tug 2913 was named St. Angelo at a ceremony attended by the Prime Minister of Malta, Joseph Muscat and the island nation’s Minister of Transport Ian Borg. The tug provides port towage and environmental assistance and serves the island’s LNG needs by safely operating at Delimara LNG Terminal. Dame has outfitted the vessel with a number of options to ensure its suitability for such tasks, including a gas protection system, double drum render recovery winch, firefighting system and oil recovery capabilities.